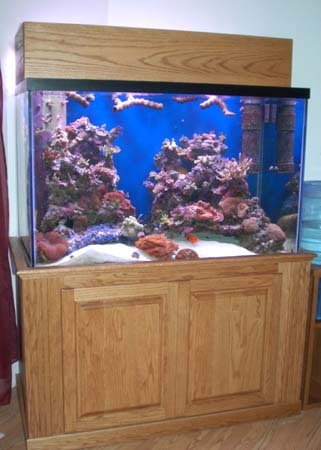 Here is a calculator that Scott Morell has developed to assist you in building your own aquarium stand for tanks up to approximately 500 gallons. This stand will have two parts, the frame and the removable facade. Enter the length and width of the tank, the height desired for the stand along with a few extra questions. A materials list will be calculated and displayed on the following page for the stand frame and the facade along with assembly instructions for both. The stand frame can be built using either 3/4 inch Plywood or MDF. We will be making "Lamination Beams" by cutting the plywood or MDF to size and laminating them together to make beams that are 1-1/2" thick and 2-1/2" or 4" wide. This makes a very strong beam that will not warp. The floor, top and all six sides will be wrapped with 3/4" MDF. We recommend painting all surfaces, inside and out, with an epoxy paint. This will protect the stand for years. The facade will be made using a combination of lumber and plywood. The facade will be a three sided single unit that will slide over the front and sides giving a nice finished appearance. We like to make the facade high enough to cover the aquarium's trim and the substrate. This way you are not looking at the ugly part of the glass below the sand level. Stand Calculator for tanks 10 to 125 gallons similar to stands found at your local stores. Low Profile Canopy Calculator For canopies 7 to 14 inches tall with a hinged top. High Profile Canopy Calculator for Canopies taller than 14 inches. This canopy has doors on the front with optional access doors on the ends. Option of full or partial back for hang on equipment. Construct these stands at your own risk. The authors and GARF will not be responsible for any damage or injury caused by improper construction of the stands. The combination of wood and water can lead to serious consequences, so please use common sense or consult a professional carpenter if you do not have the proper experience.